Catalase has one of the highest catalytic activities reported, near the diffusion-controlled limit. Catalases are tetramers of four identical subunits (220 to 350 kD), each with a heme prosthetic group at the catalytic center. Eukaryotic catalases bind NADPH, which helps to stabilize the enzyme (3). In humans, the highest levels of catalase are found in the liver, kidney, and erythrocytes, where it is believed to account for the majority of hydrogen peroxide decomposition. Studies in a mouse model system have demonstrated the importance of catalase in preventing methemoglobin formation in erythrocytes (4). 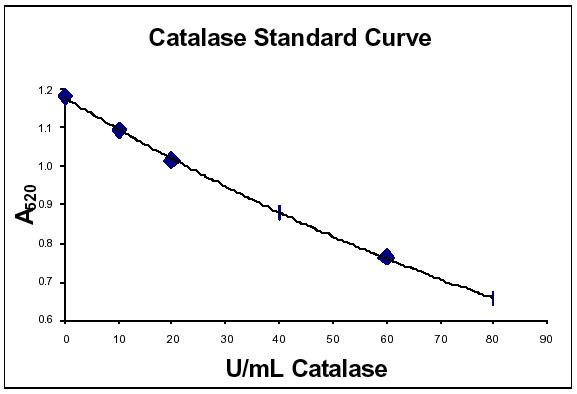 Catalase activity can be directly monitored in the ultraviolet region (7), however the UV assay is subject to interference due to absorption by protein and other components in biological samples. This colorimetric, cuvette based catalase assay involves two steps. Since the rate of dismutation of hydrogen peroxide to water and oxygen is proportional to the concentration of catalase, samples are first incubated with a known amount of hydrogen peroxide. The remaining hydrogen peroxide, following a fixed incubation period, is then determined by the oxidative coupling reaction of 4-aminophenazone (4-aminoantipyrene, AAP) and 3,5-dichloro-2-hydroxy-benzenesulfonic acid (DHBS) in the presence of H2O2 and catalyzed by horseradish peroxidase (6). The resulting quinoneimine dye is measured at 520nm. Notes: Catalase is very unstable at high dilution and should be kept cold and assayed within 30-60 minutes after dilution. Whole blood samples may be stored at 4°C for up to two weeks but it is recommended that samples be stored at –70°C for long-term storage. Red blood cell lysates, undiluted, are stable for 5 days at 4°C. Long term storage should be at –70°C. 1. Deisseroth, A. & Dounce, A.L., Physiol. Rev. 50, 319-375 (1970). 2. Zamocky, M. & Koller, F. Prog. Biophys. Mol. Biol. 72, 19-66 (1999). 3. Kirkman, H.N., et al., , J. Biol. Chem. 262, 660-666 (1987). 4. Wakimoto, M., et al., Acta Med. Okayama 52, 233-237 (1998). 5. Aebi, H. Methods Enzymol 105, 121-126 (1984). 6. Fossati, P., et.al. Clin. Chem. 26, 227-231 (1980).